FRESCOBALDI wines have long been a key player in the wine industry as its winemakers have a simple philosophy — to cultivate their vineyards in the best way possible. Observing this simple method reveals a fine selection of wines from Italy that are ideal for any meal or occasion. Members of the media recently enjoyed a taste of the wines hosted by Compagnia de´Frescobaldi president Ferdinando Frescobaldi and Sunrise Wines & Spirits at Garibaldi in Bangsar Village I, Kuala Lumpur. Accompanying him was Marchesi de’ Frescobaldi area manager (Asia-Pacific) Erika Ribaldi, a lively lady who walked us through our wine menu for the afternoon. “The wines we are drinking today are based on French varieties and we have done 157 harvests, so it is not new to us. “When talking about experience, we need to keep in mind that we have one shot a year to make the wine and harvesting is an art and you need to learn through your mistakes,” Ribaldi said. Sweet treat: The sweet Pomino Vinsanto 2006 help end the dinner on a tasty note. She said each year, the winter was different so every year came with its own set of problems. Our first course was the Pomino Bianco DOC 2010, a chardonnay from highly elevated vineyards. The high altitude means colder nights and more acidity in the wine. To maintain its freshness, the wine is not aged in barrels. Pomino Bianco is a wine that is clean and crisp on the palate and goes well with antipasti and seafood. Here, it was served with the Poached Scallop on Giant Octopus Carpaccio and Warm Truffle Potato Parmantier. The wine brought out the sweetness of the scallops and the earthy flavours of the warm truffle and potatoes. Excited by the first one, we eagerly sipped the second wine for the day, Nipozzano Riserva Chianti Rufina DOCG 2007. The wine was paired with Thin Slices of Cured Goose Liver with Mixed Cress Sprout, Orange Ricotta Pudding and Grilled Pan Brioches. The roundness of the wine is coupled with a noticeable acidity that goes well with the cured goose liver and the sourness of ricotta pudding. “The grapes in this wine come from Rufina and it is a more elegant and austere wine. “Riserva means we keep it in our cellar a year longer. 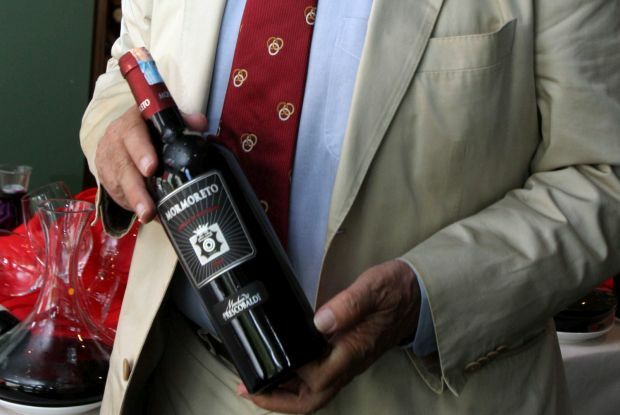 The average age for a Chianti is 12 months but for Chianti Riserva it will be 24 months,” Ribaldi explained. Risottos are typically Italian and for our third course, we were served Red Wine Flavored Risotto with Slow Cooked Radicchio di Treviso, Baked Pumpkin, Walnut and Maccagno Cheese. The risotto was served with the Montesodi Riserva Chianti Rufina DOCG 2008, a single vineyard wine. According to Ribaldi, the ratio between the Nipozzano and the Montesodi was 100 bottles to one because it comes from a single plot of land. The risotto was a complex dish on its own but Montesodi’s rich flavours of wild berries coupled with the aromas of vanilla and roast espresso beans made the course perfect, subtle and flavourful. The Seared Lamb Tenderloin on Traditional Fregola Sarda Creamed with Goat Cheese and Asparagus Salad was paired with Mormoreto Toscana IGT 2008. The lamb was tender and its juices matched the deep red Mormoreto. The grapes used are small in size resulting in more skin and the deep colour. The wine has a combination of Cabernet Sauvignon and Merlot that also adds to the colour but on the palate, the texture is like fine silk. “The persistency is how long the taste lasts in the mouth and Mormoreto lasts nice and long. For me, Mormoreto represents what Maserati stands for in the world of cars — elegance, luxury and power,” Ribaldi said. Last on the list of wines was one that tasted like the nectar of the gods; honey. 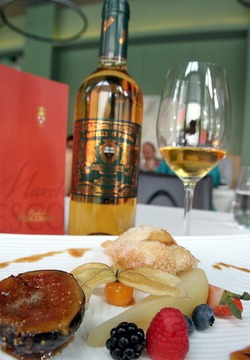 The Pomino Vinsanto 2006, which is known as a holy wine, was first produced to be served at mass. The grapes are harvested in September and left to hang on the wall of the cellar until February. The duration allows the grapes to lose 60% of its water, resulting in rich sugar content. The juice is then left in the barrel with yeast for four years. “This results in wine that is extremely sweet with an alcohol content of between 15% to 16%. Those with a sweet tooth will enjoy it,” Ribaldi said. True enough, the golden nectar was an excellent wine for dessert and we were served Deep Fried Sardinian Seadas Stuffed of Ricotta Cheese with Grappa Poached Pear and Honey Caramelised Figs. The saltiness of the Ricotta cheese coupled with the poached pear and caramelised honey brought out the sweetness of the Pomino Vinsanto, a great way to end the luncheon. The wines are distributed by Sunrise Wines & Spirits.